I made a Code Academy account last year for my Essential Information Technology class. We were instructed to complete the HTML & CSS section, but because of the deadline I felt like I ended up rushing through the last few tutorial sections and did not get as firm of a grasp on the language as I could have. Python was definitely more difficult than CSS, but still manageable. I believe that this website is an incredible asset to anyone wanting to learn about coding. As far as tutorials go I would say it’s much more hands on and accessible and aims to help people not only manage different coding languages, but actually use, apply, remember and truly learn them. While I would only recommend the website to family and friends who I think are interested in coding, I think tools like this should definitely be utilized in classrooms. However, I think it is essential that teachers using Code Academy realize that students will pick up the language at different paces and should be conscious of making sure kids don’t see the course as a race against the clock or against one another. In July of 2013 Samara Lynn released an article titled “There Are Plenty of Women in Tech, You Just Haven’t Noticed”. In her article, Lynn makes the argument that the “real” problem with Women in Tech is the lack of social media representation, attention and approval given to the women occupying actual “techie” jobs. However many people have argued that even when women do manage to enter the tech industry, they are pushed into management and business roles rather than purely technical positions. This raises the question: which of the two claims is true? Are women more inclined to take on jobs that require “soft-skills,” or are “techie” women simply underrepresented? I certainly agree with Lynn’s claim that women are just as capable as men in occupying “techie” jobs, however the title of her article is misleading. The fact remains that only “twenty percent of software developers are women… Comparatively, 56 percent of people in business and financial operations jobs are women.”2 According to Harvey Mudd’s President, Maria Klawe, women tend to stray away from careers in technology because they think it’s not interesting, they think they won’t be good at it, and they think they will be working with a number of people that they just wouldn’t feel comfortable of happy working with. With those three major contributing factors in mind it’s no surprise that women would feel more comfortable pursuing careers in management or business considering that according to the United States Department of Labor “the largest percentage of employed women (40.6 percent) worked in management, professional, and related occupations.” Simply put- these fields are far less male-dominated than technology, and by extension more accessible and inviting towards women. Lynn, Samara. “There Are Plenty of Women in Tech, You Just Haven’t Noticed.” PCMag.com 24 July 2013. Web. 17 Sept. 2014. <http://www.pcmag.com/article2/0,2817,2422200,00.asp&gt;. Miller, Claire. “Technology’s Man Problem.” New York Times 5 Apr. 2014. Web. 17 Sept. 2014. 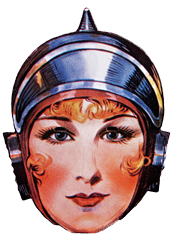 <http://www.nytimes.com/2014/04/06/technology/technologys-man-problem.html?_r=0&gt;. Ni, Zheyan. “The Most Powerful Women In Tech 2014.” Forbes 28 May 2014. Web. 17 Sept. 2014. <http://www.forbes.com/sites/zheyanni/2014/05/28/the-most-powerful-women-in-tech-2014/&gt;. Fidelman, Mark. “Here’s the Real Reason There Are Not More Women in Technology.”Forbes 5 June 2012. Web. 17 Sept. 2014. <http://www.forbes.com/sites/markfidelman/2012/06/05/heres-the-real-reason-there-are-not-more-women-in-technology/&gt;. 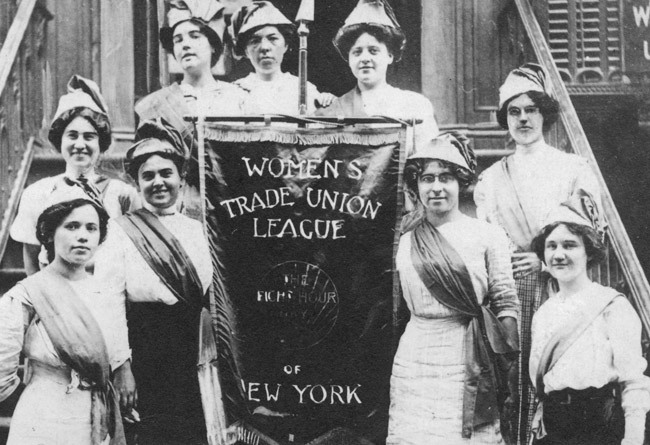 Formed in 1903, the Women’s Trade Union League worked alongside the National American Woman Suffrage Association to demand safe working conditions, the eight hour work day, and respect for women both in and outside of the work place. The photo above is courtesy of Cornell University’s Kheel Center. For additional reading on the Women’s Trade Union click here. 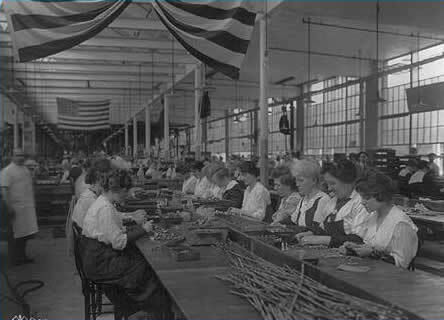 With Americas involvement in World War I in 1917, many women supported the war by entering the workforce, particularly as factory workers. The women in this photograph are inspecting automatic pistol parts. For more information on the roles of women in WWI visit The National Women’s History Museum. During the War women not only took to the factories to do their part, but began occupying stereotypicaly masculine occupations in society such as fire-fighting. 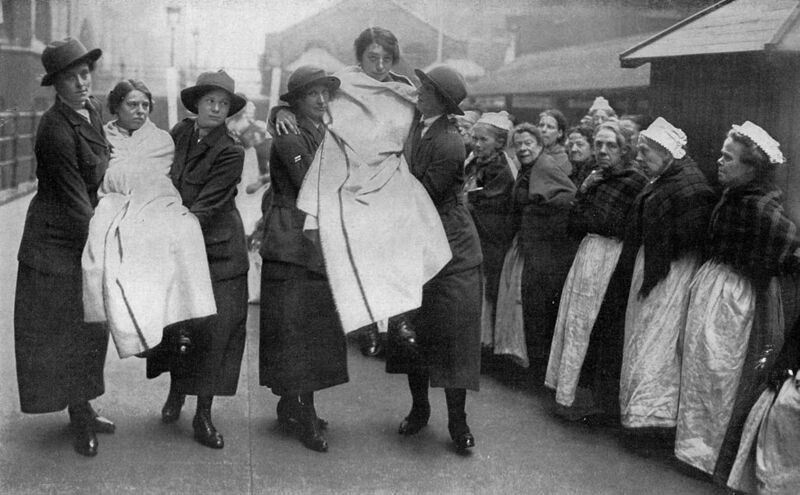 As seen in the image above entitled “Doing a Man’s Job: Women As War-Time Fire-Fighters” a group of women are seen practicing a drill. The photo was published in National Geographic in 1917, and can be found through wikimedia. Click here to see more images from the April 1917 issue of National Geographic. While electricity remained expensive, the 1910s saw a surge of domestic electricity. 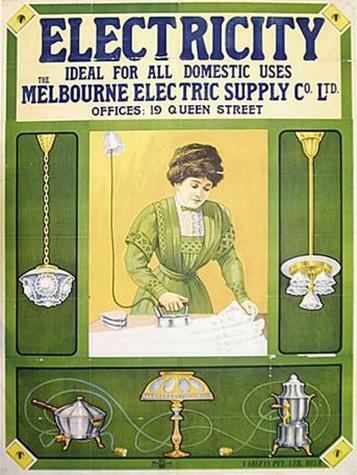 As seen in this image, women were encouraged to see electricity as a means of using new, more “practical” and “efficient” electric powered home gadgets such as the electric clothes iron. This image is courtesy of Museum Victoria. For more information on Home Life/ Electricity in the 1910s click here. 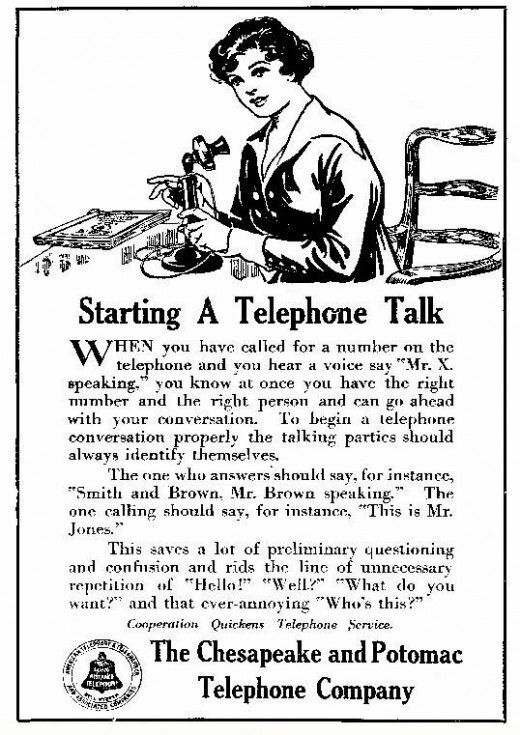 Although the telephone was invented years earlier switchboard systems and the integration of electricity in the home highly increased the prominence of a home telephone in the 1910s. The telephone which was originally intended exclusively for business use soon became integrated as a form of social communication for all people, women in particular. 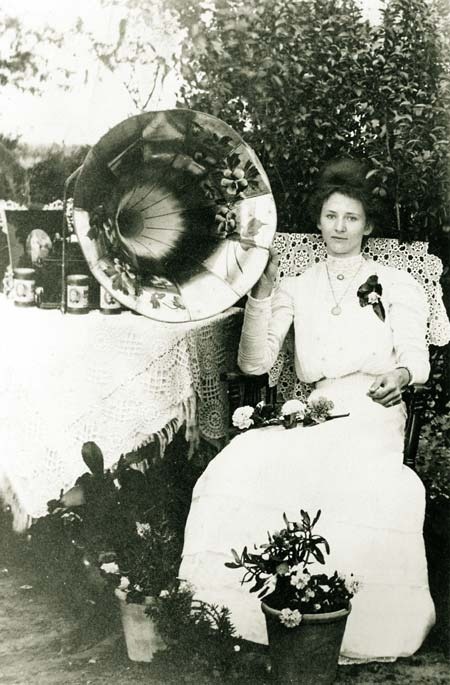 Both this advertisement (left), and the photo of a woman with the Edison Phonograph (right) were found through Pinterest and are fall under the creative commons licence.